Pong iPhone Case Blocks Harmful Radiation | OhGizmo! There have been plenty of arguments saying that cell phones emit harmful radiation and will basically turn your brain into a pile of goo. I’m not really sure how much of this I believe, after all watching too much TV was supposed to have a similar effect when I was a kid. 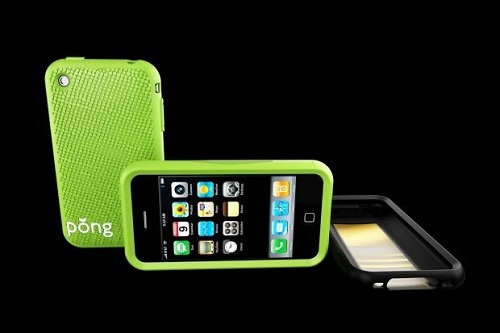 Anywho, if you’re worried about radiation from your iPhone, then look no further than the Pong case. This special case is supposedly able to reduce intense ‘hotspot’ cell phone radiation by 85%. That leaves only 15% of the radiation, which should be easily thwarted by your tin foil hat. Alright, so maybe they do emit radiation and whatnot, but this case will set you back $60. Really, do you want to drop that much cash on a case that looks decent and may or may not have radiation-blocking powers? I think I’ll spend my cash elsewhere. If you are blocking the radiation, you are dropping its strength is communicating with the cell phone tower. All cell signals are forms of radiation, but its all non-ionizing and at such a low wattage it doesn't matter. The key work here is 'block'. You typically have 2 types of material for this type of application; one which absorbs the energy and one that blocks it. Since this says 'block' I'll assume it's the latter. This means the energy is not lost in heat as it would be were it absorbed therefore it's being reflected. The cover wraps around the part of the phone not facing the person and leaves the part against your head open. So the energy is reflected back to the user. And and the users head is therefore absorbing MORE of the energy. However even if they're using an absorber material as Absentia points out if you attenuate the power you're reducing its effective signal strength. This is a dumb idea no matter how you look at it. Great .. now how am I to get my cell phone popcorn fix? Bahaha, then the metal backing of your $60 dollars you just invested shorts out your $300 phone, and then it'll for sure protect you from 100% of the radiation. Permanently.